Prices for TC-P46G10 is priced well at around $1200. A similar quality LCD TV such as the LG47LH55 will cost $1400 while a Sony KDL-46XBR9 will run you $1900 and a Samsung LN-46B650 $1600. 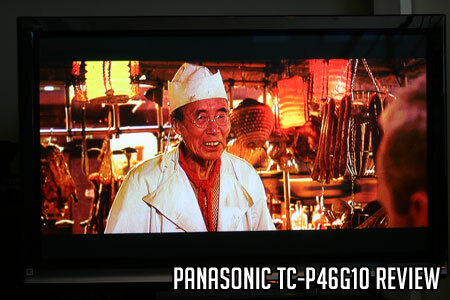 So compared with similar picture quality LCD TVs the TC-P46G10 is well priced. Against other plasma models neither LG nor Samsung make a 46" plasma TV so there are no comps – leaving the TC-P46G10 will an excellent value proposition in the 46" size range. This Panasonic offers an unusually bright picture for a plasma television – competing with LCD TVs in this area. Black levels are somewhat compromised with normal television signals and contrast is competitive though not great for a plasma TV. Aesthetics are a highlight and the TV calibrated very easily to D6500. 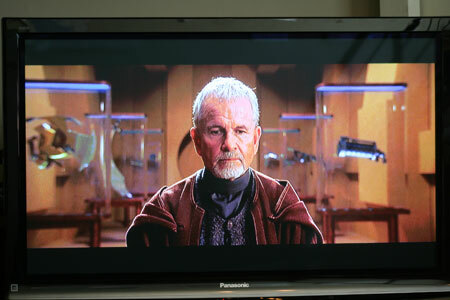 Up conversion from 480i: 480i resolution is a great test of a TVs upconversion and processing chip sets. The signal may be likened to what you would see with your normal digital cable or satellite signal. The picture quality from 480i signal sources is slightly soft and shows some graininess. Color rendition is realistic and certainly on the subdued side. Dark shadow detail is excellent, while black levels are lacking depth and punch. Blacks can appear dark gray and hazy with 480i signals input. The processing chip sets in Panasonic TVs have been quite good for a long time but I feel like the company has stagnated here for some time and are not progressing any further in this area. 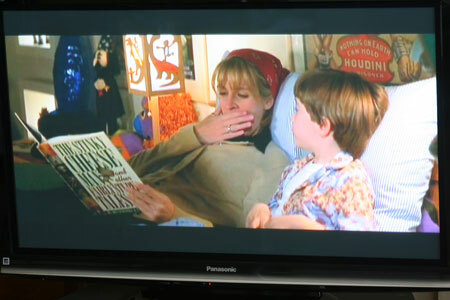 This Shot from Stepmom captures the slightly hazy blacks present with a 480i signal input. 1080p HD Picture Quality: Black levels are deep and strong with an HD signal input through HDMI. While not the best we've seen lately, they lose the dark gray haziness that the G10 displays with a 480i signal. Color is plenty saturated and dark shadow detail remains excellent. This shot from the Blu Ray version of The Fifth Element shows the vivid colors presented along with excellent blacks with HD signal sources. Black Level/Contrast: As mentioned above, black levels appear sufficient though not excellent with and HD signal while appearing weak with a 480i input source. This result concurs with our post calibration ANSI checkerboard contrast test which held blacks at .11 average luminance. Final contrast measurement was 1202:1 which would be an excellent result for an LCD but is a rather weak result for a plasma TV. The TVs strength lies in its white brightness which measured an average luminance of 30.50. This result nears LCD TVs in brightness and points to Panasonic's desire to compete with LCD TVs in this area. Dark Shadow Detail: Due to the high brightness of this plasma dark shadow detail is excellent. 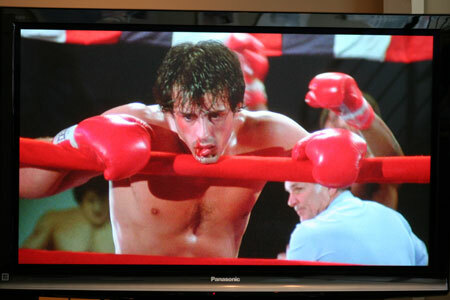 This scene from the Blu Ray version of Rocky displays good shadow detail and strong colors. Color Rendition/Color Accuracy: Color rendition is more subdued and realistic than the large majority of TVs on the market – both LCD and plasma. At times color information appears to lack pop, but this is more with 480i signal source content. Colors are much more saturated with HD content. Colors are somewhat subdued but realistic with a 480i input signal as evidenced by this shot from Stepmom. Viewing Angle/Off Axis Viewing: Perfect off angle viewing. Motion Lag: No motion lag. False Contouring/ Mapping: Through testing of various dark scenes we noted no false contouring and mapping – an excellent result. Aesthetic Considerations: The thin thin gloss frame with bevel rounded edges is very appealing. The framing bezel is just a touch over 1.5" - Great! The graduated silver bar in the bottom of the frame adds a nice 3-dimensional touch. The stand does not swivel side to side (Panasonic needs to get to work on that option). Total depth of the 46G10 has increased from previous models to about 3.8 inches. Video Aspect Ratio Sizing: The Format button on the remote controls this function with options: Just, 4:3, Zoom, Full, H-Full. Panasonic's Just aspect ratio setting does a great job of displaying an algorithmically balanced picture image. Inputs: 3 HDMI, 2 Component, 1 15pin PC, digital SD card slot. Pretty much everything you need. Remote Control/Menu Functionality: The menu is very simple and straightforward but with ample options except white balance controls. Picture settings are discrete per input which is always a plus. The remote is functional, easy to use and rather unappealing. Audio Output: There is no voice enhanced feature option for sound though I found the volume to be sufficient. Sound is a little muddy and I would recommend every TV include a voice enhanced option as so much broadcast material these days needs it. Speakers are 10W X 10W with a 15W subwoofer. The A-I sound option equalizes sound as a compressor and is useful for watching TV by toning down volume increases in those annoying ads. Features: The Viera Cast feature may be useful in the future as it connects to Panasonic's version of web TV like U-tube, Picassa, Bloomberg News, The Weather Channel, Amazon Video On-Demand and Panasonic's Concierge Service. While not very useful now, these connection features are nascent and may be important later. The Viera Link feature allows the user to control other viera link capable outboard equipment. The TV comes with a stock THX setting that puts the TV very close to D6500 right out of the box. The G10 has some decent anti glare qualities. Maximum Power consumption for this TV is 531 Watts. Review Equipment Used: Sony Blu Ray BDP-S1 High Definition DVD player, Sony DVP-S50 DVD player, Comcast Cable, Sencore Color Pro 5000, Sencore Auto Cal Pro, Sencore signal generator.